I was just thinking yesterday about how long my nails were starting to get. Then I woke up this morning to find a chunk of the nail on my right middle finger missing. I have no idea how it happened. I didn't have any cracks or weak spots on that nail. But there it was staring back at me, the whole corner missing, snapped off cleanly like someone had taken a clipper to it while I was sleeping. So everything has been trimmed back, which I guess is ok in the long run. I had a few nails that were taking a path of their own, so trimming them back has made them look straight again. Then it was time to work on the next part of the ASBMF Challenge and tackle a rainbow design. After a lot of thought, I decided to do scotch tape rays, à la Chloe's Nails. 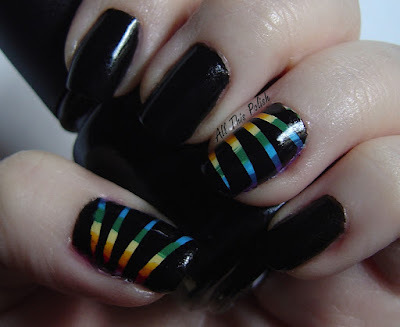 I've done scotch tape manicures before but this was the first time I did small rays versus big sections, which would be more like color blocking. 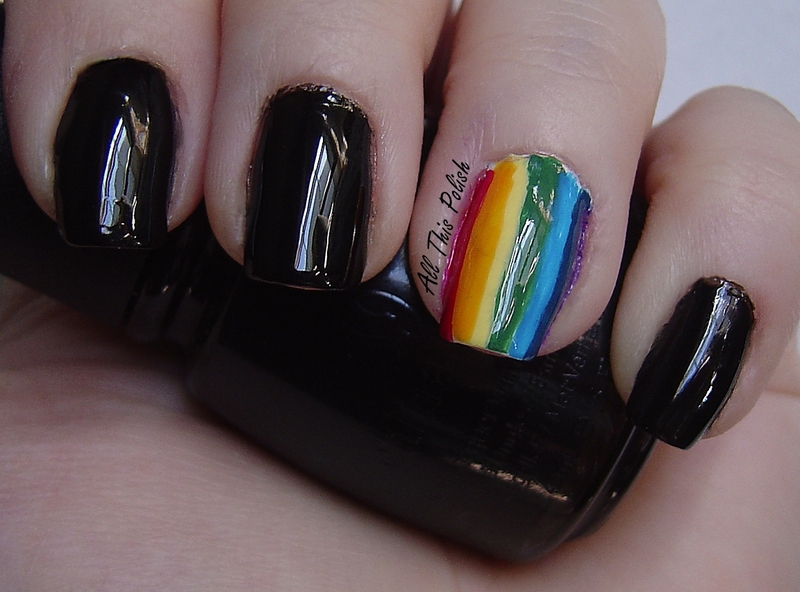 I started out by free handing a rainbow with vertical stripes on my thumbs and middle fingers. For the rainbow, I used China Glaze Poinsettia (red), Orly Crush On You (orange), Orly Lemonade (yellow), OPI Don't Mess With OPI (green), OPI Ogre-The-Top Blue (blue) and OPI Funky Dunkey (violet/purple). I didn't really have any polishes that would work well for indigo so I made one on a paper plate by mixing two drops of Ogre-The-Top Blue, one drop of Funky Dunkey and one drop of Wet n Wild Black Creme. I put a coat of Seche Vite over the rainbows so they would dry faster and I wouldn't have to wait as long to apply the scotch tape. On the rest of my nails, I used two coats of China Glaze Liquid Leather. 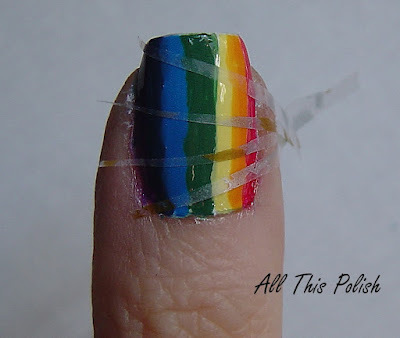 Next I took 4 thin cut strips of scotch tape, which I cut at an angle so one end was skinnier than the other, and applied them to the rainbow nails. The Scotch brand tape I used has silver and gold stars and squiggle designs on it, so that's the gold and silver blotches you see on the strips above. Once I had the tape strips on and secure, I went over them with a thicker coat of China Glaze Liquid Leather and then immediately pulled off the strips with tweezers. I think my right thumb actually came out the best. I had the thinnest strips of tape on my thumb and they were angled better than on my other nails. But overall I think the final design came out ok. Not exactly as I had pictured it in my head but close enough that I'm satisfied with it. Back on Sunday, when I posted pictures of my glitter sandwich mattified, one of the things I mentioned was that I finally got around to doing the April Showers part of the April Showers Bring May Flowers Challenge. Well, it's now 4 days later and I finally got a chance to edit the pictures and put this post together. I wish I could say that I've been really busy with all sorts of important stuff, but the truth is that I just play way too many games on Facebook! 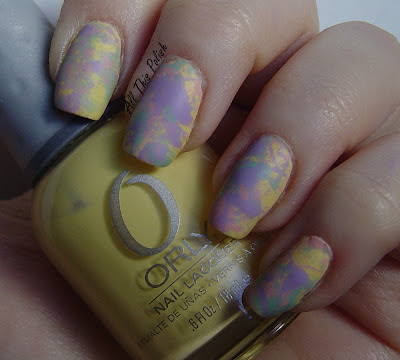 One of the reasons that I had such a hard time with this part of the challenge was that I had just recently done an April Showers themed manicure back in March. I originally posted it about it here. So I was kinda stumped trying to think of something that wasn't too similar to what I had already done. When I was trying to come up with a design, I started to think about how my absolute favorite thing about rain showers is laying in bed late at night, with the window cracked open just a bit, listening to the rain hit off the blacktop on the street outside. 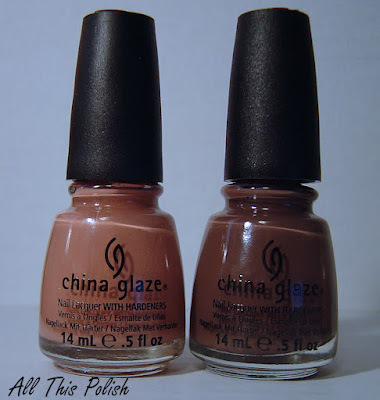 China Glaze Stone Cold is one of my recent buys that I had yet to try and I thought it would be perfect for representing a paved street. The gritty matte finish would be perfect to act as blacktop and once top coat was added, I thought it might give the impression of a wet, rain-soaked road. 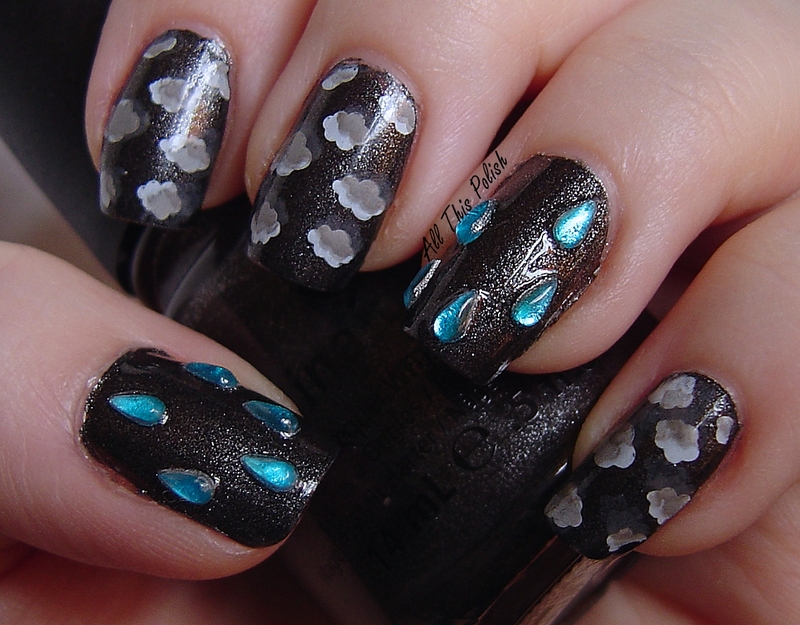 I also wanted to do something different for the raindrops than what I had previously done. That was when I remembered I had bought a set of rhinestone wheels from Bundle Monster back in January and had yet to use any of them. Looking through the wheels, I came across these blue raindrop/teardrop shaped rhinestones that looked perfect for what I had in mind. I had a feeling that having these rhinestones on all of my nails would probably drive me nuts pretty quickly, so I settled on just using them for accent nails. And I decided to reuse the clouds idea from my previous April Showers manicure, but with a bit of a twist. Rather than having bright white clouds, I had an image in my head of darker, grey storm clouds staggered with white clouds overlapping them. My only problem was that I didn't have a very good grey polish for stamping. I couldn't get any greys to show up well over the black polish. So I decided to reverse my original idea and stamp white clouds first, then overlay grey clouds, so that part of the white clouds would remain intact and other parts would look darker and more stormy. 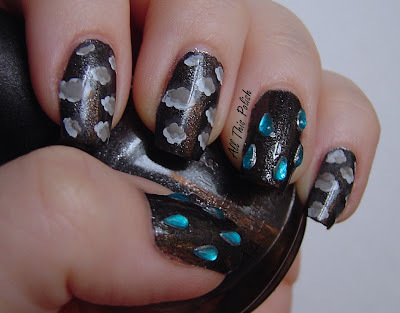 The clouds design is from Konad plate m79. For the white clouds, I used Konad Special Polish in white and I used China Glaze Recycle for the grey clouds. 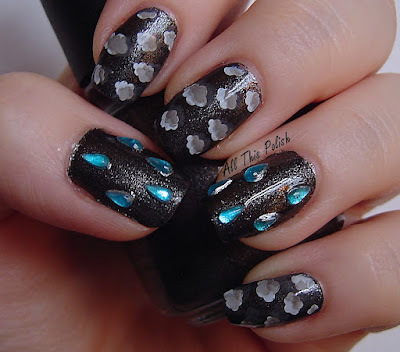 I used one coat of Seche Vite on all the nails with the clouds and two coats on the nails with the rhinestones. I ended up only wearing this for a few days. I put it together Sunday night, took pictures Monday and by Tuesday night I was taking it off. That's not to say that I didn't like it. But it was the first time I had ever worn rhinestones of any type on my nails and I was not used to my nails feeling bumpy like that. I kept having the urge to pick at those little buggers and knock them off my nails! I will just have to be try to get used to having bumpy nails once in a while, especially since I have so many more types of rhinestones in the Bundle Monster set that I want to try some day. I will say that I was surprised how well they stayed on. I just used top coat to put them in place and then, as I mentioned, used two coats of Seche Vite over them. That seemed to be enough top coat to get rid of any edges on the rhinestones that might have gotten caught on something and gotten them ripped off my nails. Next up...A Rainbow After the Rain. Be sure to check out some of the other ladies participating in this challenge. 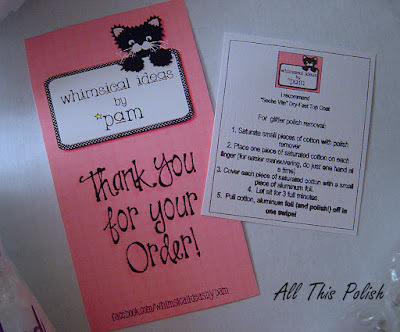 When I received my order from Whimsical Ideas by Pam, it was the most excited I think I have ever been about new polish. I looked at the bottles and thought, "I need at least one of these on my nails IMMEDIATELY!" 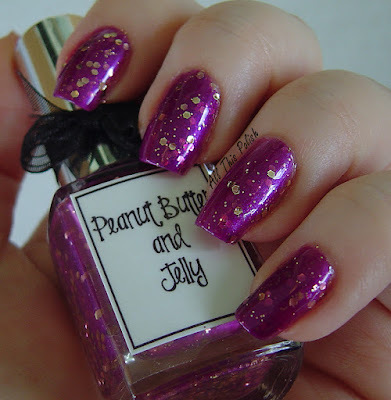 I decided to start with Peanut Butter and Jelly, a purple/raspberry jelly polish packed with gold micro glitter and larger hex glitter. I wore Peanut Butter and Jelly by itself, three coats total, and I topped it off with a coat of Seche Vite. There's not really much else that needs to be said, the pictures tell it all. 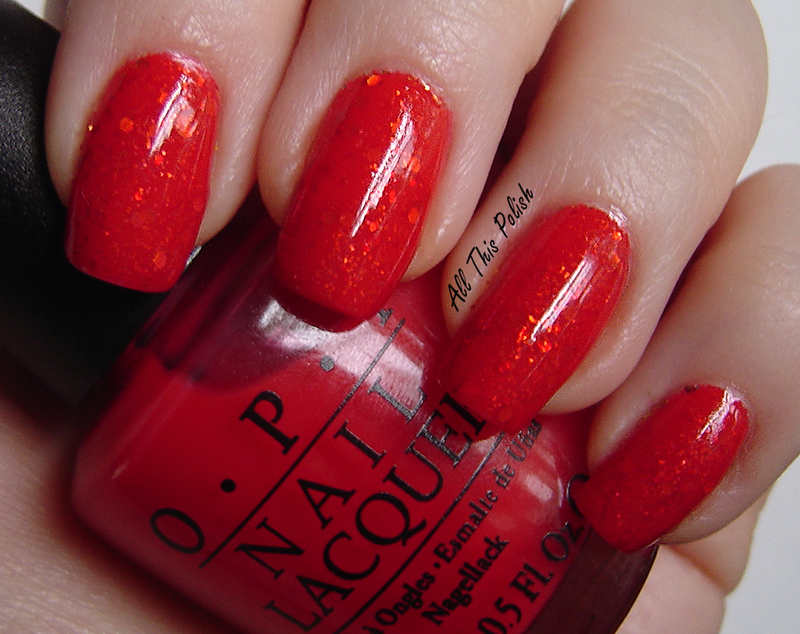 It's simply a great polish...great color combination and the name is just genius. I'm so glad I finally bought this polish. 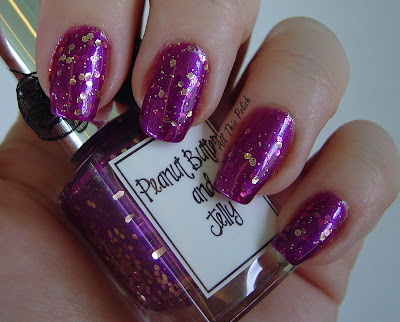 I loved looking at the glitter and how it was layered in between all that jelly polish. And let's not even discuss how dorky I was acting at work when I realized I was wearing Peanut Butter and Jelly while eating lunch, which was...yup, you guessed it, a peanut butter and jelly sandwich! It took all I had to refrain myself from taking a picture on my cell phone. Maybe next time...! Back when I was deciding on what to do for the glitter sandwich part of the April Showers Bring May Flowers Challenge, one of the things I kept thinking about was this absolutely beautiful manicure I had seen on The Posh Polish. Even though I ended up not doing something similar to Jamie's mani for the challenge, I had to go out to get Essie Marshmallow because I knew that one day soon, I would be using Marshmallow in a glitter sandwich. So somehow an innocent trip to Target, to pick up some needed supplies and look to see if they carried Marshmallow, resulted in me coming home with 5 Essie bottles. Target had Marshmallow in with their everyday Essie display, so I grabbed a bottle of that. They also had a special display with the Essie Navigate Her Spring 2012 Collection. I had seen this collection for quite a while at other stores but kept talking myself out of it. I must have had a weak moment while at Target though because I ended up buying four out of the six colors. 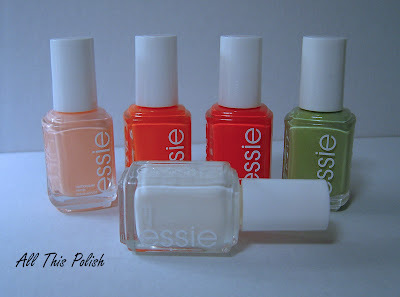 So besides Essie Marshmallow, I came home that day with A Crewed Interest, Navigate Her, Ole Caliente and Orange, It's Obvious. Orange, It's Obvious, Ole Caliente and Navigate Her. The other part of my haul post is from my purchase from Whimsical Idea by Pam. I had seen a number of Pam's polishes on other blogs and I just couldn't resist any longer. I sent her an email late one night to let her know what colors I wanted to order and by the morning I had an invoice from her. Within a day of sending my PayPal payment, I had another email with tracking and two days after it shipped, my order had arrived and I was completely giddy over them all! I decided on four of Pam's polishes: Hatched, Kismet's Pajamas, Peanut Butter and Jelly, and Seuss. 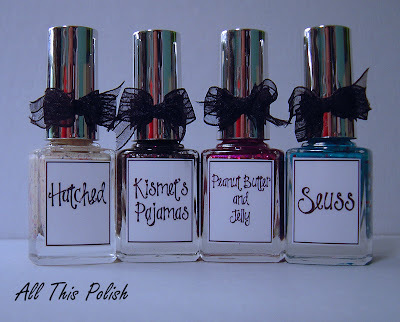 Other than nail polish, I've not one to be very girly-girl, but if you'll indulge me this one time...aren't these just the cutest bottles ever!!! I seriously love the little bows on the caps and the pretty handwriting on the bottle labels. Here are a few shots I took of my new prize possessions as I was opening the package up. I love the little "thank you" card she put in with the order and, even though I was already familiar with the foil method, I also love the card she included with instructions for removing her glitter polishes. I think that's a very sweet touch. 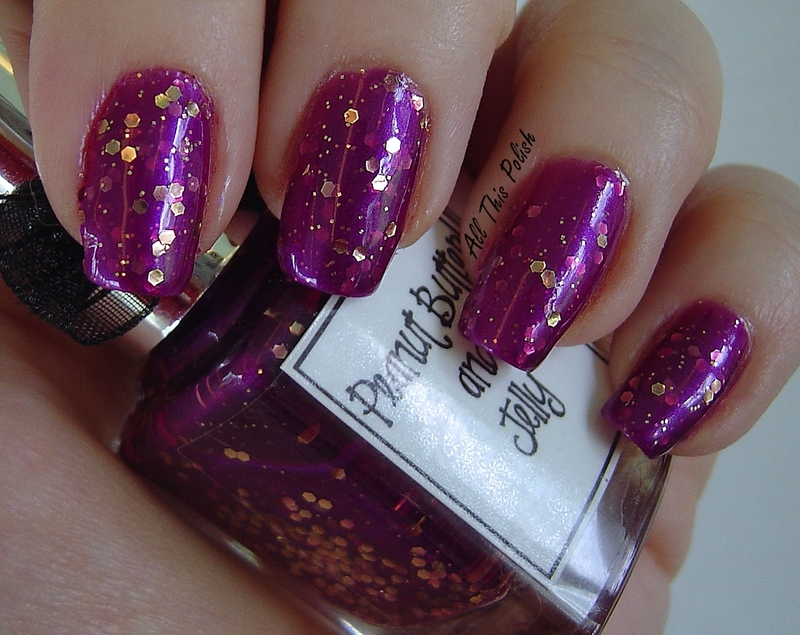 And here is the best picture of them all, a shot of the back of the bottles with a view of all that glittery goodness! 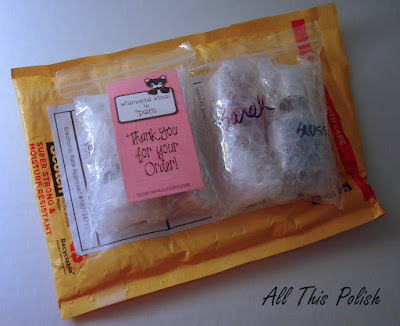 Ordering from Pam is a little unconventional compared to other indy polish brands, but it's super easy! 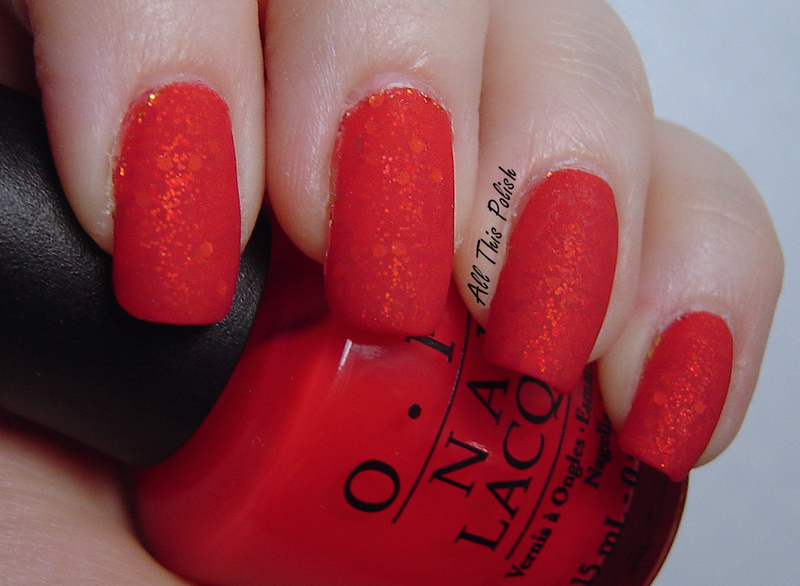 You can visit her Facebook page to view pictures of all of her polishes. Once you decide what you want, you just have to email her your order to pea422000@yahoo.com. Don't forget your shipping information! You should get an invoice back within a few days with your total and PayPal instructions. If you use a different email address for your PayPal account than the one you used to email in your order, make sure to let her know so that she can properly match up your payment to the order you placed. Just a quick post before I head to bed. Last week, I wore the the OPI Big Hair...Big Nails glitter sandwich from the challenge for a few days but then I started to get bored with it. I still didn't have any new ideas for the next part of the challenge, April Showers, and I wasn't in the mood after work for removing all that glitter, so the next best thing was to slap some Essie Matte About You on top of it. I really liked the way it looked with the matte top coat added. I never used to be into matte polishes but, especially with glitters, I'm really starting to love experimenting with matte finishes. 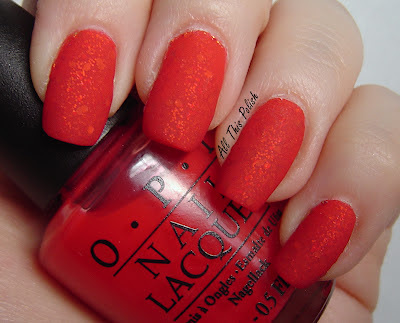 I have a small haul post I'm working on and some swatches of one of the polishes from my most recent nail mail, so I hope to have those two posts up within the next day or so. And if the weather decides to cooperate tomorrow, I'll be able to take some pictures of my April Showers mani that I finally got around to doing today. I was sort of anticipating my April Birchbox and sort of not anticipating it. 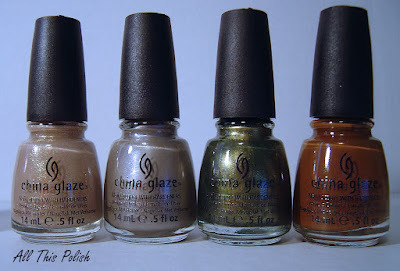 I had seen a sneak peak of someone else's box online, before mine arrived, and they had received Zoya Bevin. Normally, getting a mini Zoya would be awesome but I already have Bevin, so I had my fingers crossed that my box would have a different color from the True Collection. I've seen a couple other people who received Lotus, which I don't have. 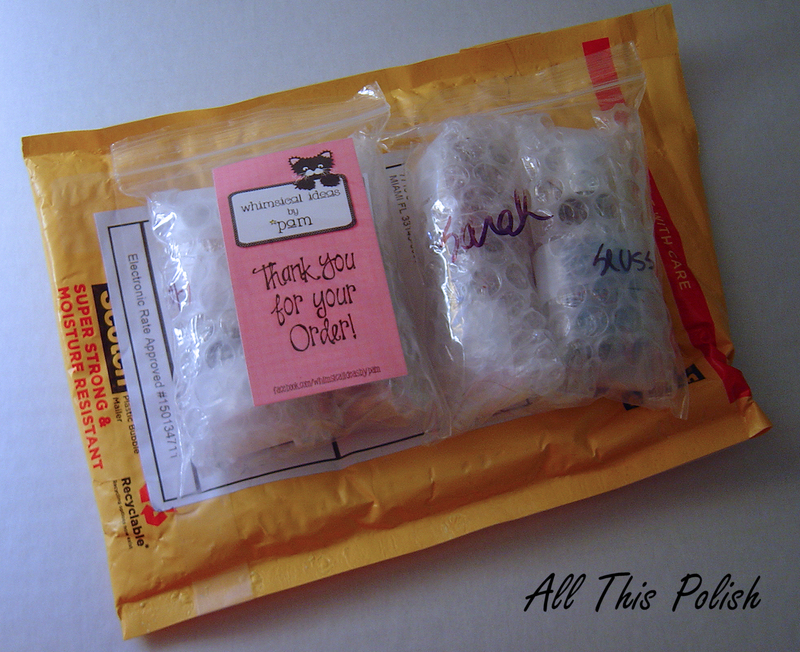 Alas, when my box arrived a few weeks ago (I'm a little late with this post), inside was a mini Zoya Bevin. Oh well, what can you do? At least it's a color I love and look at how cute the mini bottle looks next to the normal Zoya Bevin bottle! 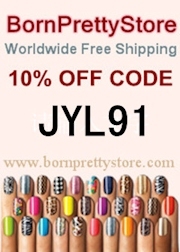 - a sample of Juicy Beauty organic oil-free moisturizer. It's also supposed to be blemish clearing, which is always a plus. - a mini bar of Erno Laszlo active pHelityl soap, which is supposed to be moisturizing and help balance your skin's pH levels (and is almost as cute as the mini Zoya bottle). - Yes To Blueberries brightening facial towelettes, moisturizing and cleansing all in one. I think I'm most looking forward to trying these. They're supposed to remove all traces of makeup and have a fruity scent. - a sample of Yogini by Harvey Prince. I've worn this scent a few times already and I like it quite a lot. It definitely fits with the earthy vibe of this month's box. Not my favorite Birchbox out of all the ones I received so far since starting my subscription last August, but it's got some good items for sure. 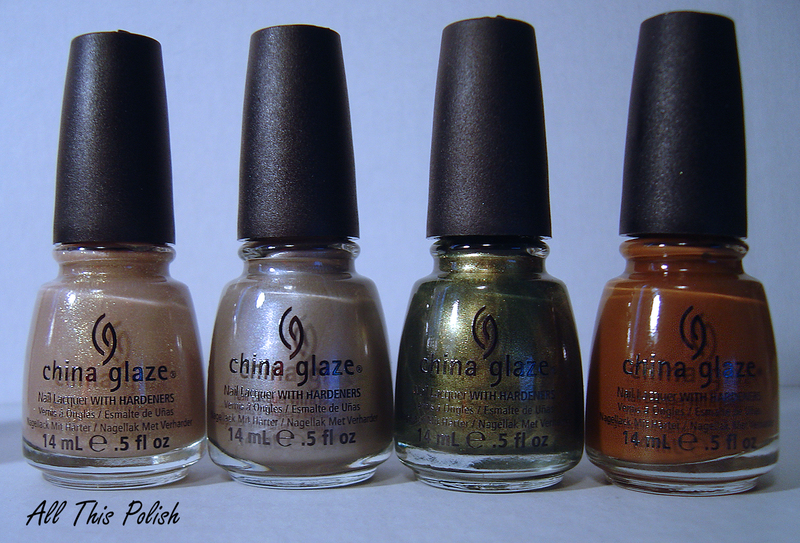 I would have been happier if I had received Zoya Lotus, but that's just the luck of the draw. It's not like Birchbox would have known that I had already bought Bevin on my own. So, while I'm a little bummed about Bevin, I'm still happy with this month's samples. Last Thursday, I checked my email to discover a huge surprise. 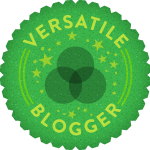 It was an email from Ria, from Ria Loves Pawlish, to inform me that she had nominated me for the Versatile Blogger Award. I was shocked! 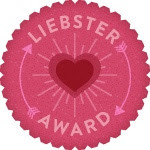 This is the first award I've been given by a fellow blogger and I have to admit, I got a little giddy. 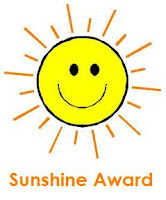 Thanks so much to Ria for the award! Be sure to check out her blog. She has a lot of great swatches and reviews up on a ton of different colors. I don't know how "new" exactly you could consider some of the bloggers that I chose. I might actually be the newest one out of almost all of these, lol. But I went through the list of awesome blogs I already follow and tried to pick out blogs that first of all, I love, and that were "sorta" new in terms of blogs that started either sometime this year or they started, more or less, sometime within the past 12 months. So most of these basically started sometime between April 2011 and April 2012. Be sure to check all of them out if you haven't already. 1. I am a huge baseball fan. I love all sports in general, but baseball is my absolute favorite and my favorite team is the Phillies. 2. I have a female grey tabby cat named Dusty, who will be 9 years old in May. 3. Doing my nails is probably the only "girly" thing I'm good at. I have two hairstyles that I can do: up and down, lol, and I can never seem to pick the right colors when it comes to lipstick or eyeshadow. 5. I love the month of March. My birthday is in March. And more importantly, two words: Shamrock Shakes! 6. My favorite color is green. I guess that could work for loving March too, lol. Lots of green themes in March for St. Patrick's Day. 7. Besides nail polish, I could easily spend all my money at Office Max or Staples. I love Post-it Notes and Sharpies and little desk organizers and gadgets and computer accessories. I'm a total nerd! Thanks again to Ria! Be sure to check out her blog and all the blogs I've posted about tonight! Part 3 of the Spring Challenge is a glitter sandwich. I wasn't completely sure what I was going to do. I had a few ideas in mind, but I don't have a ton of jelly polishes. 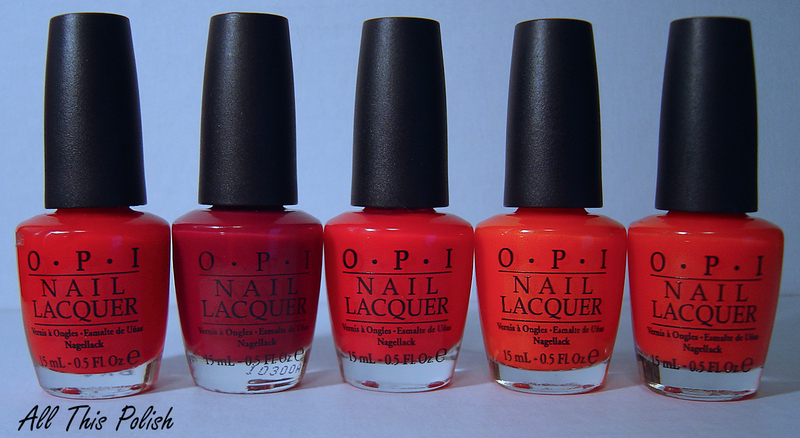 Most of them are from the OPI Texas Collection, which are great, but they are all pretty similar. I definitely need to add some jellies to my stash in some other colors, like greens or yellows. I finally decided to start out with three coats of OPI Big Hair...Big Nails. 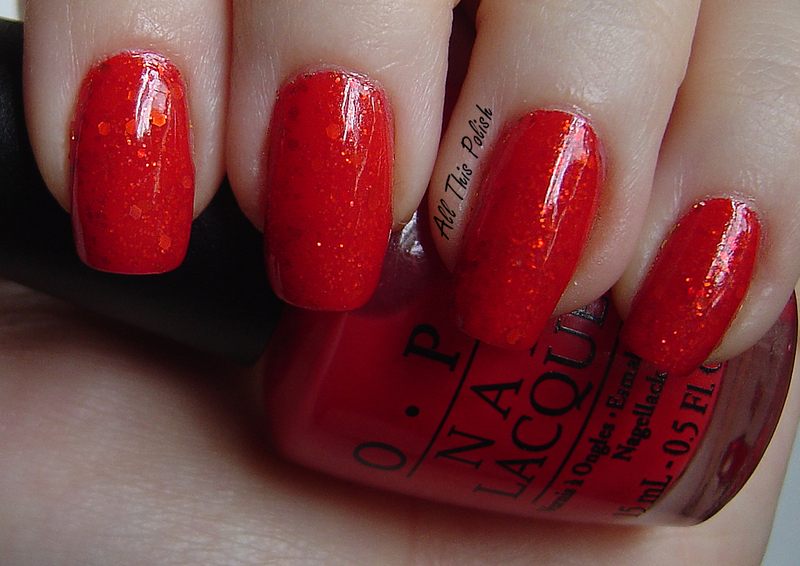 I've seen it described as a mix between a reddish coral and a light cherry red. To me, it seems more like "cherry tomato" red, if that makes sense. Once I had it on, it leaned more coral/orange to me. The idea I originally had would work better with a much redder jelly, so I decided to save my original idea for another day and started looking through my glitters for something else. 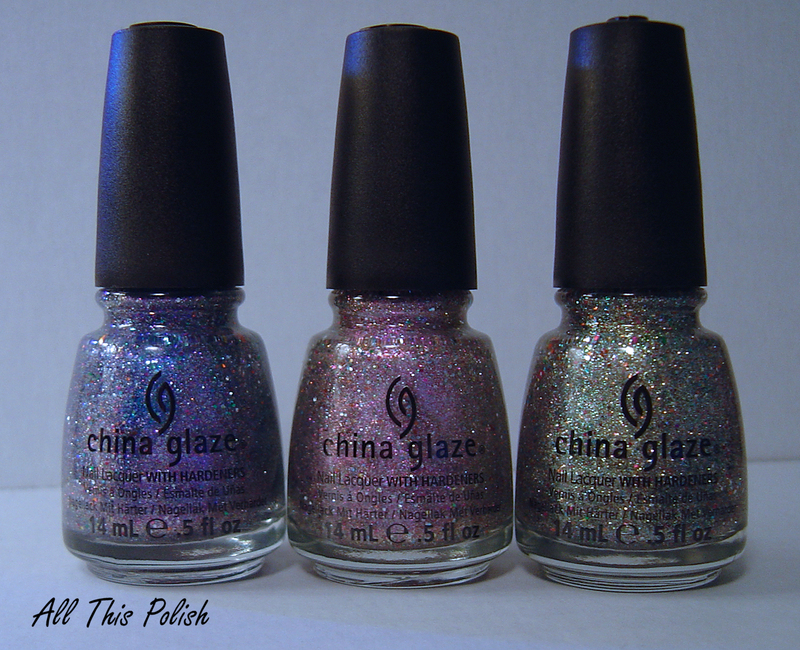 That was when I came across China Glaze Electrify, which I immediately thought would be perfect to use. The only drawback with Electrify is that it's all tiny glitter and I wanted to have some larger glitters in this as well, so I grabbed Synergy from my collection of L.A. 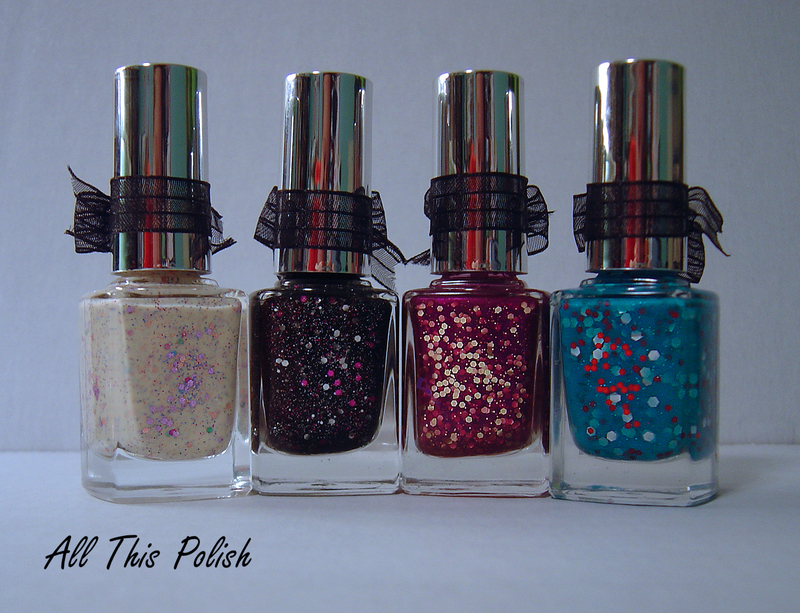 Girl Glitter Addict polishes. I saw Purge sitting next to Synergy and, for a second, thought it might be interesting to add large green glitter to contrast the colors in Electrify, rather than using gold glitter. 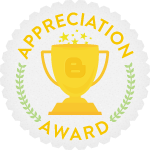 But in the end, Synergy won out because it's not just gold glitter, it's holographic! So after the three coats of Big Hair...Big Nails, I put on one coat of Electrify and one coat of Synergy. Then I ended up putting on three more coats of Big Hair...Big Nails. I started with one coat and then added a second, but I wasn't really satisfied with its "squishyness" until I put on the third coat. My only regret is that I wish I added a second coat of Synergy. It could have used some more of the larger hex glitters, but I'm still happy with the final outcome. Hopefully I'm not missing anyone. Please tell me if I am! There is also a number of ladies with great designs but who don't have blogs to link to. So instead, you can always check out everyone's pictures and links by heading over to the Facebook page. Spring ASBMF Challenge #2: Ladybugs! 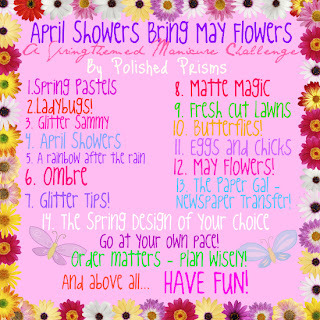 I have a short post today for my second installment of the Spring Challenge April Showers Bring May Flowers. 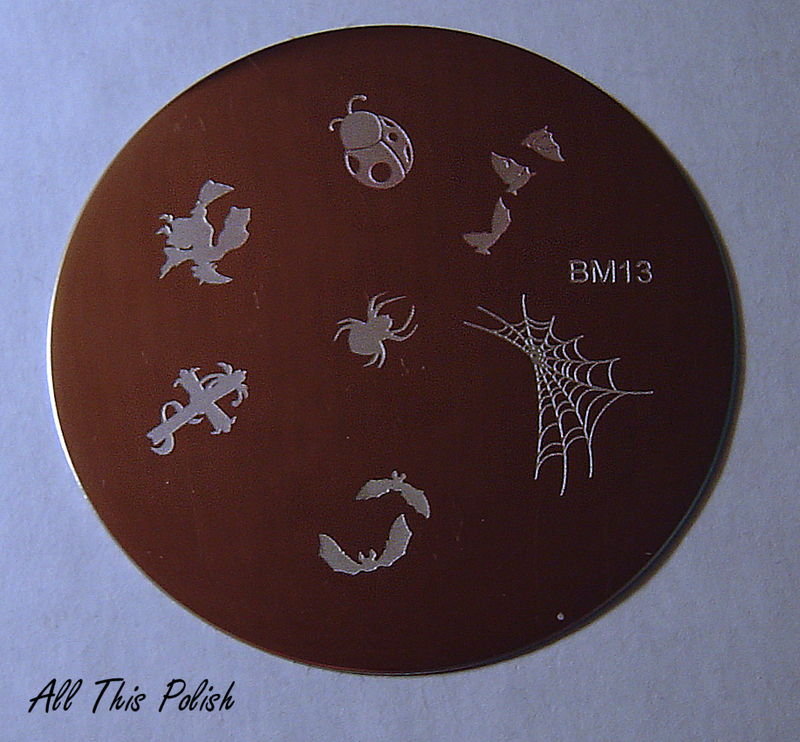 Challenge #2 is ladybugs and I immediately thought of a ladybug design that is on one of my Bundle Monster stamping plates, plate BM13. Even though I knew I wanted to use this plate, it took me a little while to figure out exactly how to use it. I did actually paint my nails with a medium gray to start but then when I stamped the first ladybug, the gray was just too dark so I scrapped that idea. I decided to stamp multiple ladybugs over Orly Au Champagne instead, but only as an accent so I applied 3 coats of Au Champagne to my thumbs and ring fingers. I spent the next 5 minutes marveling over Au Champagne's satin matte finish! Somehow, in all the reviews of the Orly Holiday Soiree collection this past winter, I had completely missed the fact that Au Champagne was a matte. I must have read it, but it somehow just never registered in my brain. I was so not expecting the beautiful satin matte finish it has and now I'm so glad that I bought this back when I saw it moved to the clearance table at Sally Beauty. I had only used it once before and that was just as a base on a nail wheel for swatching Lynnderella Snow Angel. I must have been so excited about getting my Lynnderella order that I was apparently oblivious to the finish of Au Champagne when it dried. Anyway...for the ladybugs, I applied a small amount of Konad Special Polish in red to the body of the ladybug design and a small amount of Konad Special Polish in black to the ladybug's head, then scraped and stamped. 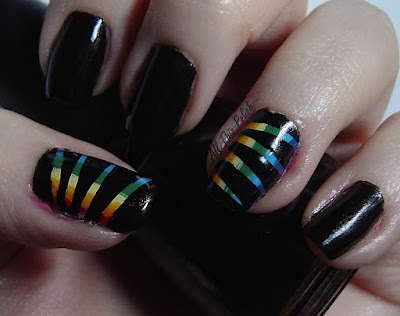 I did that about 3 or 4 times per nail and just placed them in random directions on different parts of each nail. I took a small dotting tool and Wet n Wild Black Creme to fill in the dots of the ladybug design when Au Champagne showed through. On the rest of my nails I used 2 coats of Zoya Sooki and with the largest dotting tool and Wet n Wild Black Creme again, I placed random dots over Sooki to give it a ladybug motif. I do really like this, but I'm not a huge ladybug fan, so I'll most likely be moving on to the next challenge within a day or two. Although I was happily surprised at the reactions I got at work today with this design. 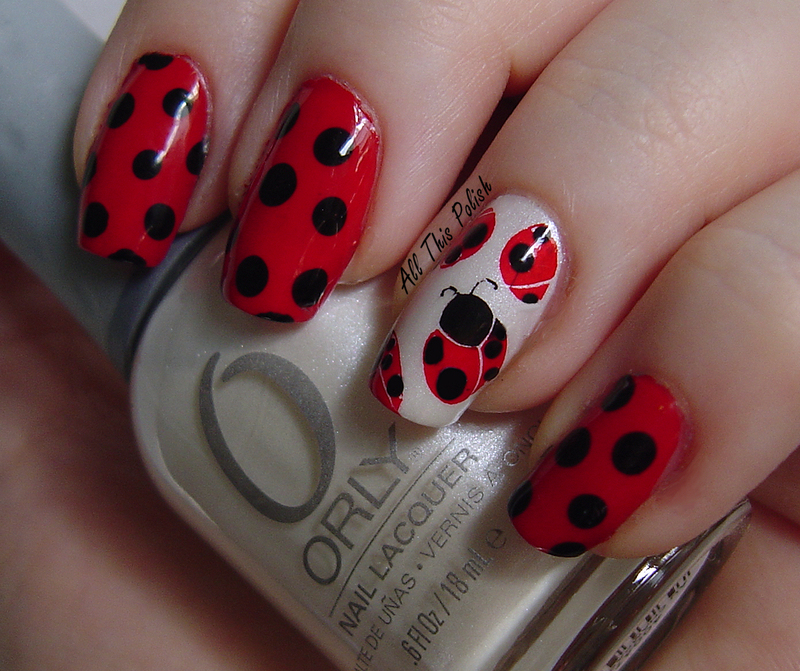 There were a lot of "Oh my God, are those ladybugs on your nails?!" It really got a lot more attention than I expected! One of the cool things about doing a challenge like this is that if I wasn't doing this challenge, I probably would have never done this design. But because of the challenge I was able to experiment and work with themes I probably wouldn't have thought to do on my own. 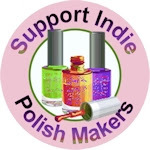 Be sure to keep an eye on Hannah's blog over at Polished Prisms. She'll be updating her posts with links to all the wonderful ladies also participating in this challenge. So check it out! Yes, I entered my first challenge. I can't believe it either. I see people doing different challenges online all the time and it's like boom, boom, boom...they just keep spitting out new designs every couple days. I don't know how they do it all, I think I'd give up after like day 3! 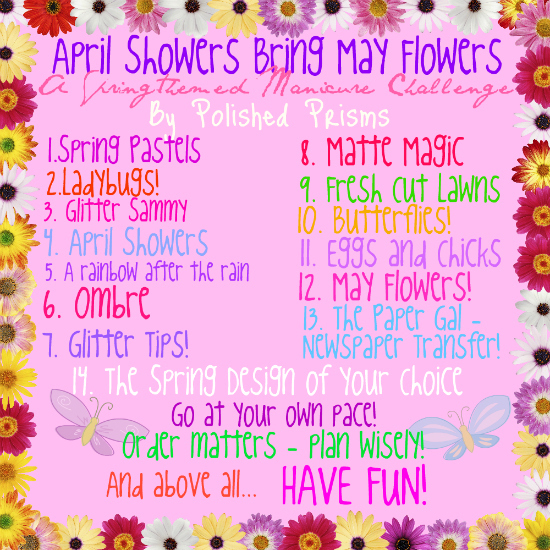 But then Hannah from Polished Prisms suggested a more laid back challenge on Facebook and she came up with this Spring "April Showers Bring May Flowers" Challenge. We don't have set dates. Everyone can do it at their own pace, according to what meets their schedule, which is perfect for me since I usually only change my nails once a week, maybe twice. A few people are already on ladybugs, but that's the whole point...you do it when you can. I just need to remind myself not to panic when I start to see more people getting days ahead of me, lol. If you're interested in joining the challenge yourself, Hannah set up a group on Facebook, April Showers Bring May Flowers Challenge. You don't have to have a blog, you can join the Facebook group and post your challenge pictures there instead. So I was planning to start this a few days ago, but for some reason I really hit a brick wall trying to decide what to do. Since Easter is this weekend, I wanted to kill two birds with one stone and pastels work great for Easter anyway. I did have this elaborate idea for small Easter eggs all over my nails, which I actually attempted. The end result though just reminded me that I need to invest in a small kit of acrylic paints for more intricate designs like that. It actually was not completely hideous, lol, but because the nail polish is not as opaque as acrylic paint, I really had to layer the nail polish on to get the designs to show and that just made the whole thing a lumpy mess! Off it came and on went plain polish just to get me through the next two days at work. Last night I came home and grabbed a bunch of pastels ready to tackle the challenge. I started with 3 coats of Orly Lemonade, hoping for inspiration. 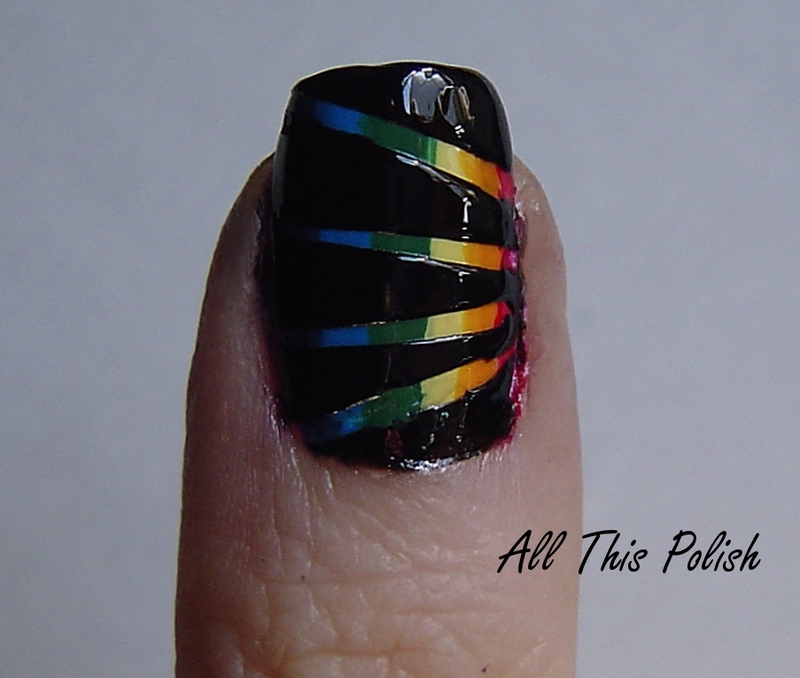 I was planning to do a patchwork scotch tape design with Lemonade and two other Orly colors, Prelude To a Kiss and Jealous, Much? but then the idea of a water marble popped into my head and that somehow led to the idea of doing a splatter manicure instead. I've never done a splatter mani before, but I've seen them online and I absolutely love them. A splatter manicure is basically dipping a drinking straw in some polish and then blowing air into the straw with strong, quick puffs to make the polish splatter over your nails. 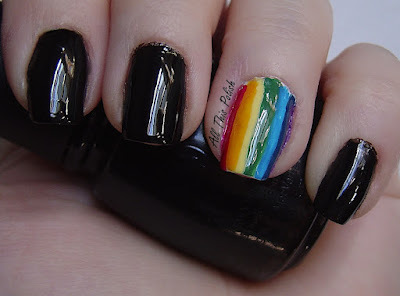 You repeat that with different colors to get a messy, but very cool effect. I think mine was a success and a disaster all at the same time. In the end, it was a success but along the way I definitely had some disaster moments and this is a technique that takes both practice and luck. Since I was doing a splatter, I also decided to add another color, OPI Rumple's Wiggin', which is pastel purple. The picture above is of the final manicure, which includes a coat of Essie Matte About You. I decided to make it matte before even thinking to take a picture of it still glossy, d'oh! So here is a picture of my right hand, which I don't usually photograph since I'm right handed and taking pictures with my left hand is a royal pain in the rear. But I wanted to show how it looked with just plain top coat, so I snapped a pic of my right hand, before adding the matte top coat to finish it off. 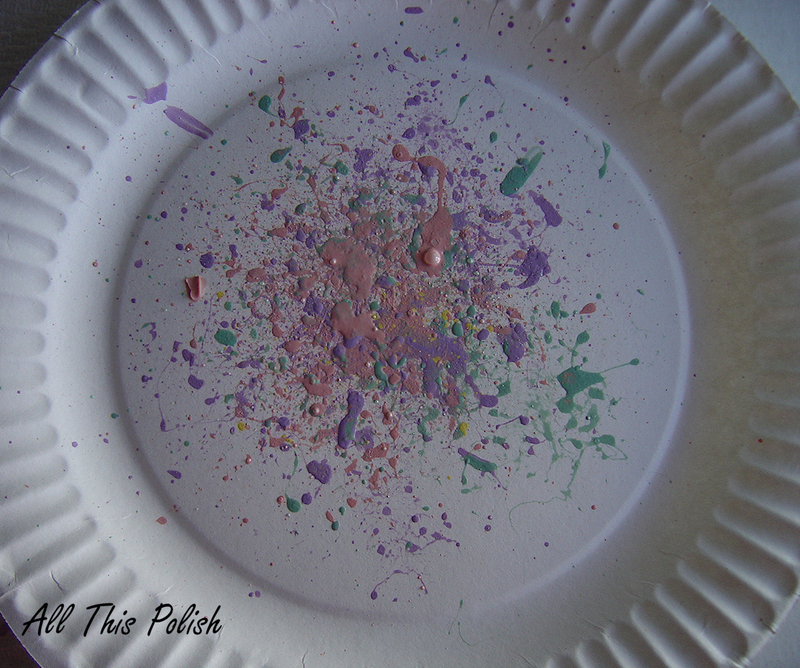 If you've never done a splatter manicure and are interested, there is a good tutorial from The PolishAholic's blog that you can read and I would also suggest checking out the different splatters that Sarah from Chalkboard Nails has done. If her splatters don't inspire you to try it, then nothing will! 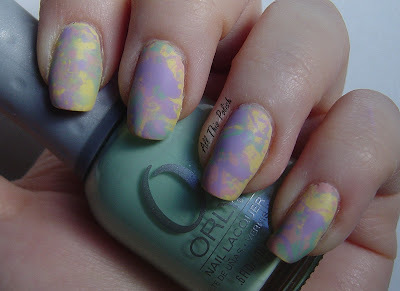 Here's a link that will take you to a list of all her blog posts tagged with the splatter label, http://www.chalkboardnails.com/search/label/splatter. A few things that I learned while doing this for the first time: practice and experiment! There are various methods to do this and you might find one way works better for you than it does for someone else. It definitely helps to hold the straw a few inches away from your nails. 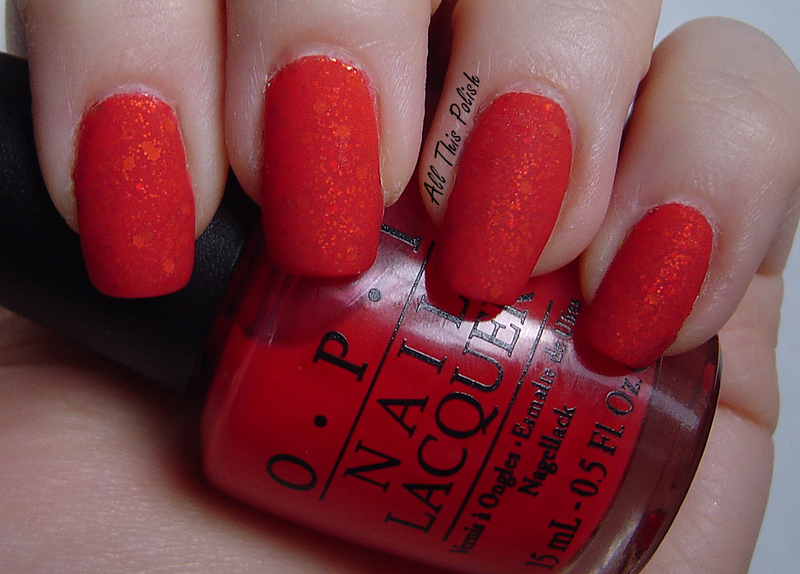 Too close and you might get big blogs of polish that just flood your entire nail. It also takes some practice to figure out exactly where to hold the straw. I can't tell you how many times I tried it and the polish splattered in a circle around my nail without any of it actually hitting my nail! I held my nails over a paper plate, which was resting on a big piece of cardboard. 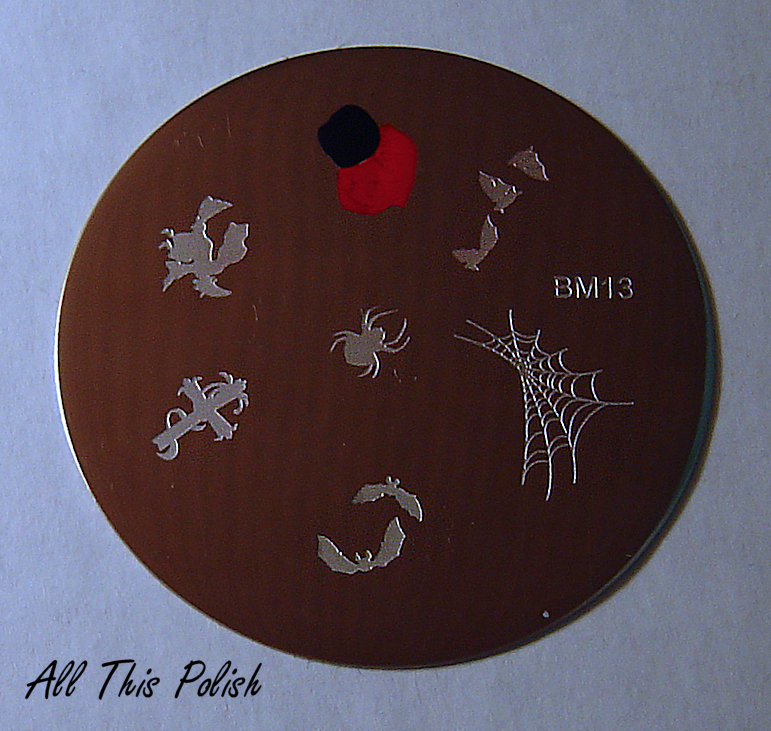 I wasn't sure how far the polish would splatter, but it didn't go any farther than the edges of the plate. It all will depend on how far away from your nails you hold the straw. Just be sure to cover and protect the surface you are working so you don't get polish all over the place. 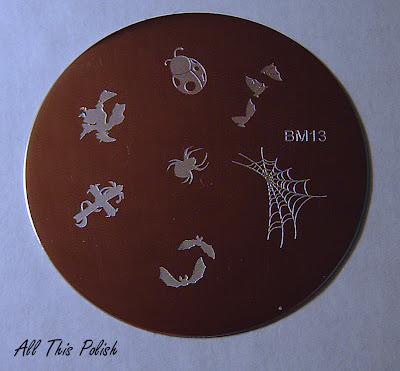 Here's a shot of how my paper plate looked after I was done with all 10 nails. Even though it can be pretty messy, I definitely plan to try this technique again with different colors. 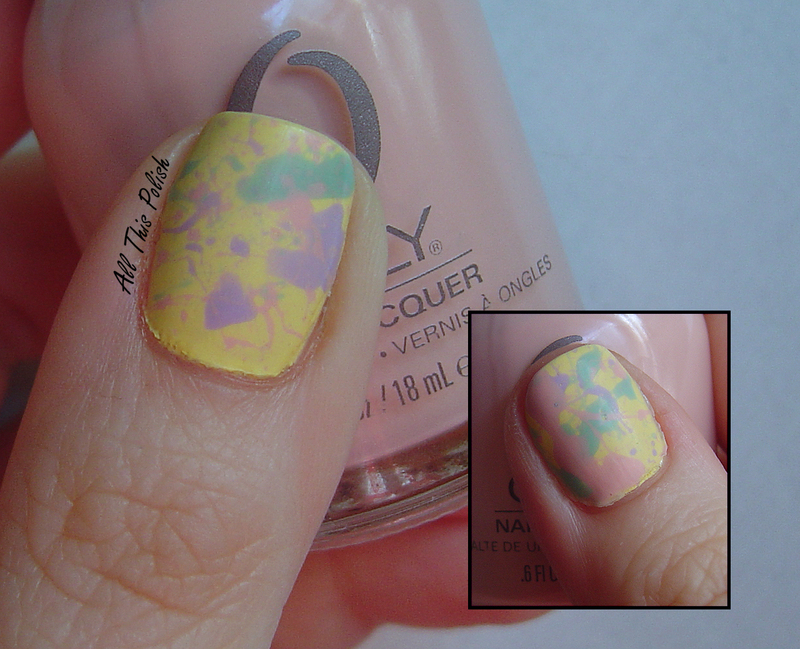 The edges between the splatters of color seemed to be more defined before I added top coat. The next time I do this, I'm going to try to be more patient with drying time before adding top coat, to see if that will cause the end result to have some more sharp edges between colors. But for a pastel splatter, I do like the way the colors kind of melted into each other. ***Edit*** April 8th 11:41pm: I had to come back and add a picture of my thumbs, especially my left thumb. Even though my thumbs ended up having the least amount of splatter on them, I think I like them the most. I don't know if it's that Orly Lemonade is just that pretty or if it's the subtle splatter versus the bigger blobs on all my other fingers, but I have been just constantly staring at my left thumb all weekend with this manicure. I have a few little hauls from the past two weeks or so, along with several polishes that I received through the mail, that I'm going to combine into one big haul post today. I already posted about Nail-Venurous Floam several day ago, but when I bought it off of Ninja Polish, I also picked up two A-England polishes. I was pretty much going to order Floam no matter what but I'd rather be able to get several polishes at once then have to pay shipping for just one bottle. I've been hankering for several colors from A-England so when I saw that Lady of the Lake and Dragon were in stock, I ordered them as well. I really, REALLY want St. George as well, but that one was out of stock so it'll have to sit on my wish list for a little bit longer. A few days before placing the Ninja Polish order, I took advantage of Zoya's Spring Promotion, which was a buy 3, get 3 free offer. I actually placed my order literally minutes before the offer was going to expire. Even though Zoya has a ton of colors to choose from, I couldn't make up my mind! But I finally settled on 4 colors from last year's Sunshine Collection: Kimmy, Apple, Tanzy and Rica, and 2 colors from the Feel Collection: Kristen (which I just used in my glitter sandwich) and Carey. Last Wednesday I was off from work and decided to do a little shopping in the afternoon, which of course resulted in some polish shopping as well. After I picked up some necessities at Target, I ran next door to Sally Beauty and proceeded to buy the rest of the colors I didn't already have from Capitol Colours collection. Sigh. I know, I know, I said I wasn't planning to get them. A week or so ago, I actually stopped in for something else and I picked up Dress Me Up and Foie Gras and I swore that was it! Even though I kinda wanted Agro, I kept telling myself I had Peace On Earth and that was close enough. But then there I was, not only buying Agro, but Fast Track, Hook and Line, and Mahogany Magic as well. Double sigh. I also picked up a couple Orly's I've been wanting to get. Nothing special, just a couple of basics that seem to come in handy for nail art: Luxe and Liquid Vinyl. 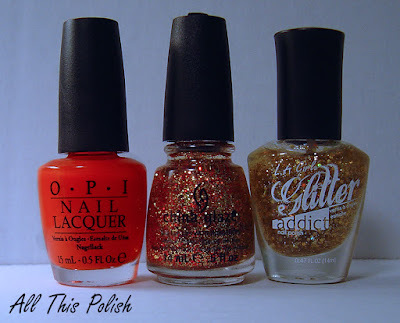 The OPI's I bought are all older polishes and I got them at CVS, of all places. 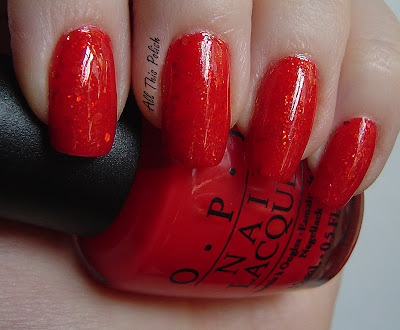 I know CVS is not supposed to carry OPI, but apparently some of them do. I never realized it because my closest CVS does not. 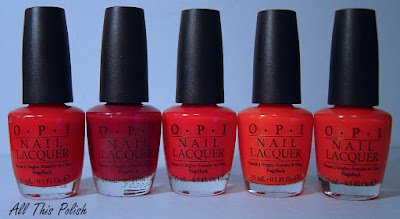 But last Fall, I had gone to a CVS a little farther away from my house looking for some limited edition Wet n Wild polishes that had been released for Halloween, and that was when I discovered that this particular CVS had OPI polishes. I've looked on some message boards and it seems there are other CVS locations that do this too. Unlike Target, which usually seems to have a set list of colors on hand at any time, this CVS is kind of hit or miss. It's like shopping at Big Lots, one week they might have a bunch of colors from the Shrek Forever After Collection, then a couple weeks later you might find colors from the Burlesque Collection. 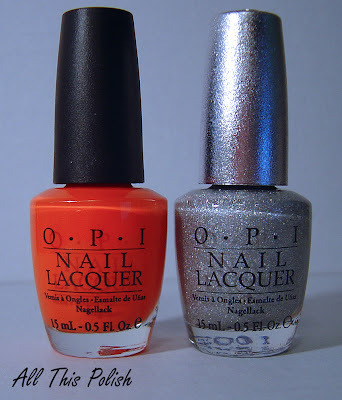 I had seen the Texas Collection there once, in fact it was the only time I saw CVS have an actual OPI cardboard display put out. At the time I had bought a couple colors like Don't Mess With OPI and San Tan-tonio. 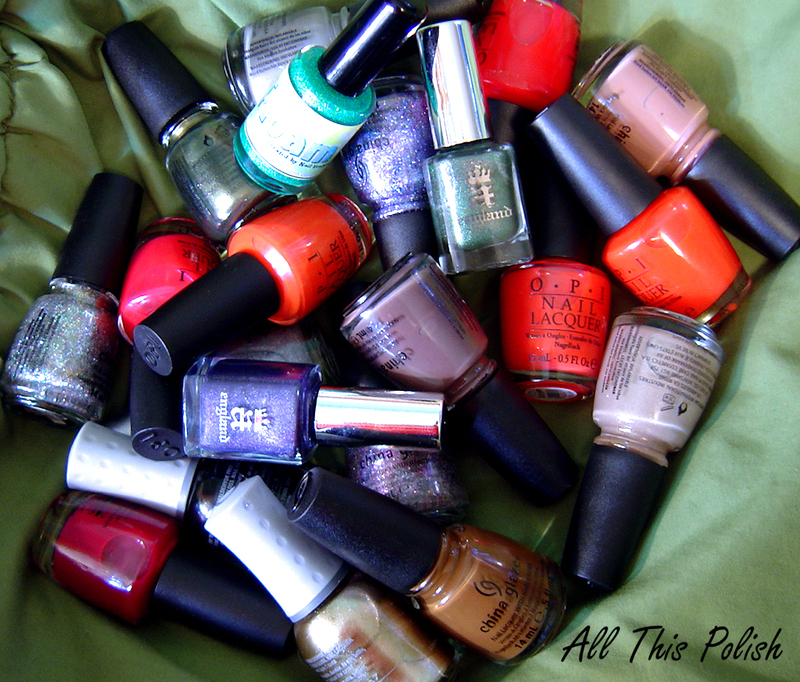 I did not, however, realize what the sorbet/jelly polishes were all about, so I didn't pick up any of those. But that's also why, when I had considered doing a glitter sandwich for my b-day manicure only to realize I owned maybe 2 jelly polishes, that I decided to head to CVS and see if they still had any of those Texas colors available. The first night I went, I picked up Too Hot Pink To Hold 'Em, Guy Meets Gal-veston and Big Hair...Big Nails. I ended up going back the next night and, after a bit of searching, found Do You Think I'm Tex-y and Houston We Have A Purple. They did not have any Y'all Come Back, Ya Hear? though, which is disappointing because I really wanted that one most of all. Hopefully, I'll be able to get it one day. 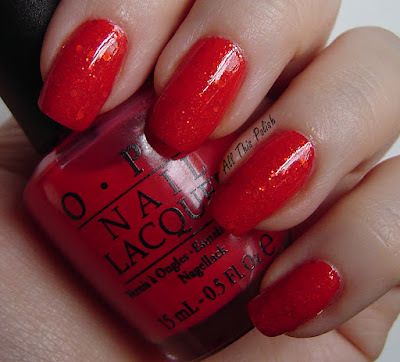 While at CVS, I also grabbed A Good Man-darin Is Hard to Find, from OPI's Hong Kong Collection, and DS Coronation. And then, just when I thought I had this post all ready to publish, I got a package in the mail today with 3 of the new China Glaze Prismatic polishes! 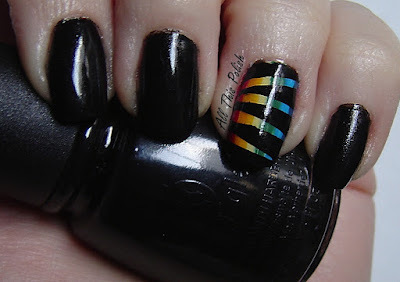 Kari from the MidAtlantic Nail Polish Enthusiasts Group on Facebook had offered to pick up some extra bottles and she was able to get me Prism, Full Spectrum and Ray-diant! Yay, thanks Kari! Now I just need to get to Sally Beauty to grab the other three.